My kids currently in the 'in between' phase of being thorough with his ABCs, and word formation i.e. M-A-T is Mat. While we are busy practising rhyming words and syllable counting, I thought why not introduce some sight words! I taught him 4 over a month, and he could not have been more excited! I've just started using a craft stick as a pointer when we read, as he loo..oves being part of the narration. The 4 words The, And, A and To, are generously sprinkled in every page of every book. So I restrict pointing to just 1 or 2 books a day! 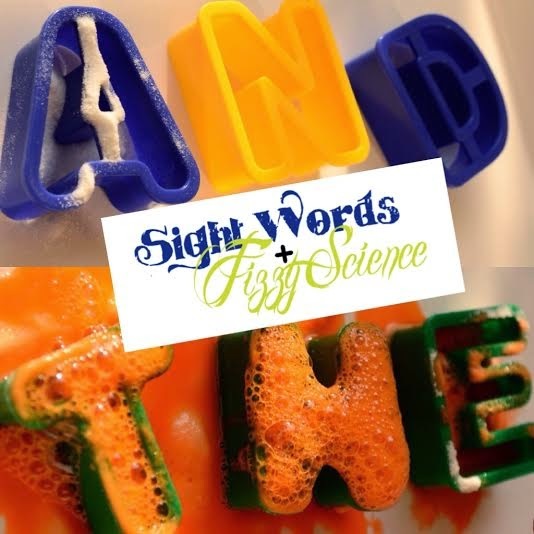 We combined sight words with fizzy science on a saturday morning. Placed a few of his playdoh cutters to arrange them into sight words over a tray. He put some baking soda inside each alphabet. Then he mixed paint (Orange was his color of the day!) with vinegar in his beaker and poured the mix into a spraying bottle. Then he sprayed vinegar over the baking soda and watched it fizz! and then some shapes too! Btw! our pre-writing practice is paying off and he wrote "THE" all by himself! For our earlier fizzy experiments click here & here ! For Learning Word Formation with Fizzy Science, click here. For Is your child Thorough with his ABC Recognition, yet Clueless about Letter Sounds, click here! Nice idea learning 'site words'. Thank you for sharing with the Clever Chicks Blog Hop! I hope you’ll join us again next week! I hadn't thought about showing the little ones how to fizz baking soda and vinegar. :) They'll like that. Four sight words over a month are good for a little one. How fun! Learning is always much more fun when there is an experiment involved! Thanks for sharing with SYC. Thanks for all the encouraging comments! hope I children never tire of Baking soda & vinegar experiments!